Through the slants series Maree ReMalia and Hyunjung Lee aim to explore endless iterations of movement using their collaborative duet, slants, as source material for working with varying cast members in Pittsburgh and Daegu throughout 2013. 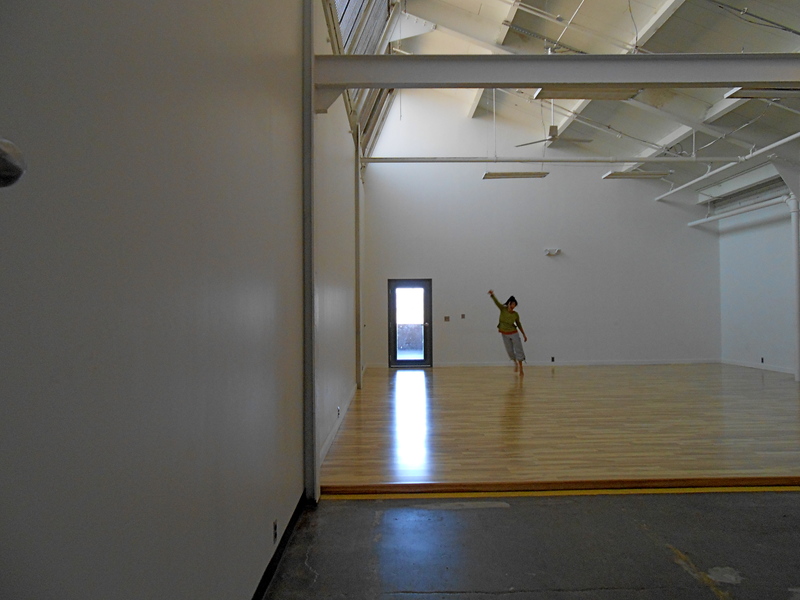 Maree and Hyun created and performed in slants through the PearlArts Movement Residency in 2012-2013. Early rehearsals were held between the U.S. and South Korea via Skype and video exchange. Hyun traveled to Pittsburgh for the month of January where they completed and premiered the duet. The playful movement amalgamation reflected their individual dance histories in traditional Korean dance, classical ballet, contemporary dance, and their common experience of Gaga. Initial themes ranged from Korean han and their comedic banter to their experience of being identified as Asian and their own associations with this definition, to their love of Korean cuisine and bacon. To view video excerpts of slants click here. Still meditating on the ideas we outlined in our proposal in my creative research, I also decided to start from the body each day. Moving, rather than planning first. Move first, then see what ideas and thoughts arise. A warm up based in Gaga, Butoh, Chi Gong, and yoga. Improvisation through movement and speech. Referencing my notes from teaching improvisation and courses at OSU. Re-entering the creating mind/experience. I was trying to channel Hyun’s movement qualities, which are so different from my own. Grounded, fleshy, fluid, wave-like, soft–a nice contrast for my light, skeletal, bound, changing of stories. Stringing together short sequences. Giving myself verbal directives, “Maree, stand in the corner,” etc. It is only the beginning of the absurd in this process. This mental voice is very helpful when alone in the studio. Improvising with my limited Korean terms out loud, but expressing them as if I am talking about the recent presidential debates. Following bodily impulses and playing with reversing and transposing movements. Trying to recall the unison repertory we learned from Kamuyot. One topic of exploration we mentioned in our proposal is Korean han or what I have come to understand as a deep, soulful sadness that is endemic to this country. A heaviness that can not be removed, but people persevere with hope anyway. Hyun told me I have the han. I think she is right. So far, I am excited that my attention has grown to include more detail in the quality of movement. I feel like I have more range or options than I did a year ago. Intuitively, I broke my rule of starting with the body moving today and began writing. “Inkshedding,” or just writing without stopping. Reflecting on what seems to keep surfacing as a theme in my creative projects and intention in facilitating movement experiences, as well as my daily pre-occupations–an obsession with the way in which we are externally perceived and how this meets how we internally experience ourselves. Also, a desire to expand or cultivate curiosity regarding perceived surface impressions and at the same time broadening the embrace of acceptable expressions through movement/text/performance. I recently went on a public art tour and one of the pieces we viewed was accompanied by a sharing from the artist. Upon first glance I saw a number of shiny, silver, wavy-shaped 3-D sculptures that create a fortress-like structure to me. I enjoyed the sleekness of the work, but did not feel particularly emotionally moved to learn more about the work. While the artist was talking I gained a new appreciation hearing of his intention and history and what the piece meant to him and was reminded as I have been by many of my respected mentors, family members, and friends that usually there is more to be known and understood. It also reminded me that living with this kind of curiosity is a practice and metaphor for many aspects of my life. This theme was also overtly part of our tour guide, Erik Martinez’s (Mayan Sites and Destinations Tours), mission when he took us to the Mayan ruins in Chichen Itza last week. He explained that in Mexico his MA in Sociological Anthropology was equivalent to that of Cultural Anthropology in the U.S. His wealth of knowledge was impressive and his perspective was unique and addressing themes that tend to recur throughout history in cultures across the globe; tendencies toward worship, ritual, sacrifice, differentiation of class, race, culture, commerce, war, and death. He shared a number of stories where he was able to point out commonalities between cultures despite their differences and he was open in saying that he did not appreciate or agree with the statement that “all Mexican’s look the same,” as he urged everyone to really see the people we encountered during our trip. On a previous tour, he was explaining how the Mayan people believe they came from corn. One Christian touree approached Erik and said “Wow Erik, I can’t believe that the Mayan people were stupid enough to believe they came from corn.” Erik is a Mayan descendent himself. So, Erik said to him, “Sir, are you religious?” He said, yes. Erik asked him from where he believed he came. The man said, “from dust.” Erik took the opportunity to express that while their beliefs on “from where” were different, the concept was similar. His tour was sharing the history and contemporary circumstance of the Mayans and also a reminder of acceptance, tolerance, and respect. During this trip I was also reading Toni Morrison’s Playing in the Dark. Her thoughts on creative process are relatable and inspiring to me. She said, “Writing and reading are not all that different for a writer.” I feel similarly about experiencing performance and creating work. She also talked about “freeing the language” from predictable stereotypes in reference to race and how this took effort. She asked questions about how we can welcome each other into the estranged or what may seem different or other or unfamiliar. This is a question in which I am interested in regard to what I create, how I facilitate, and how I ingest the world around me. How do I continue to open the lens through which I am looking and continue welcoming the unfamiliar or uncomfortable and how do I also invite others to do so? A practice of how to remain curious. All the time. More of the time. A duet performed by Maree ReMalia and David Bernabo in the Kelly Strayhorn’s Hear/Now Series where the performers oscillated between movement scores and speaking the text from Take Away the Mountain. It’s creation stemmed from enthusiastic audience response to slants revisited for 1. A rendition with live text felt like the next step. Click to view excerpts full-length slants revisited/take away the mountain in Kelly Strayhorn Theater’s Hear/Now (PA). Click to view excerpts of the re-worked slants revisited/take away the mountain at the Current Sessions (NY). Iteration 2 is a solo performed by Maree ReMalia using the recorded text Take Away the Mountain created by Pittsburgh sound and movement artist David Bernabo. The piece was created for Prescott College’s Spring Offering showcase, which was combination of faculty, alum, and student work. Iteration 1 is an adapted version of the original duet created in collaboration with Pittsburgh dance artists Jessica Marino and Sarah Parker for Lehigh Valley’s SpringUp Dance Festival.